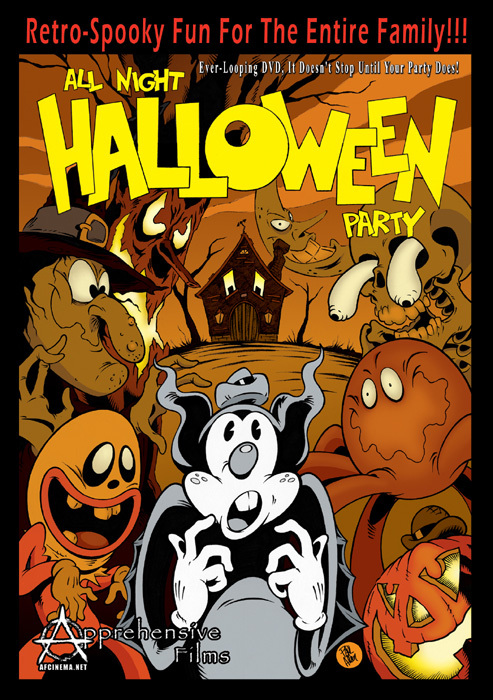 Apprehensive Films is proud to present the All Night Halloween Party on DVD! The All Night Halloween Party is retro, spooky fun for the entire family. This compilation of old-school cartoons, stop-motion animations and vintage horror trailers creates the perfect ambiance for any Halloween party. Plus it's an ever-looping DVD so it doesn't stop until your party does! With so many unique short subjects, the All Night Halloween Party can be enjoyed over and over again. Some of the classic titles included are: Balloon Land, Cobweb Hotel, Wot a Night, Magic Mummy, Devil's Ball and many, many more! Get ready for a Halloween you won't soon forget! Coming to DVD on 10-23-12, just in time for Halloween!! Right now we're posting daily!! But we're always striving for at least once a week! Thanks for reading. Happy 4th of July From Apprehensive Films! The Devil Adds Another Servant!! More Donations to the Dead!! All Night Halloween Party Release Date Bumped Up! More Funds to Ad to the Coffin Bank! !